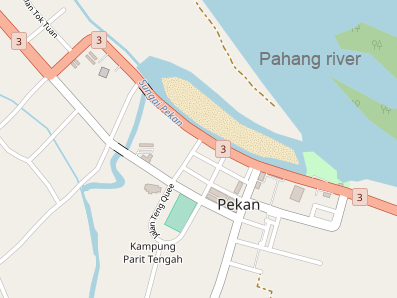 Pekan is a small and peaceful city on the eastern coast of peninsular Malaysia, located at the estuary of the Pahang river, 40 km south of Kuantan and 200 km east of Kuala Lumpur. It's a royal city, the residence of the sultan of Pahang, who lives in the Istana Abu Bakar royal palace at the southern outskirts of Pekan. The palace is not accessible for tourists. The Sultan Ahmad Shah Al-Haj mosque is a large and modern mosque at the northern end of Pekan. 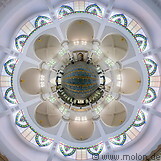 It is inside a compound and its main prayer hall is richly decorated. Other religious buildings in Pekan include the Sultan Ahmad Shah mosque, a Chinese temple (the Lei Shen Gong Buddhist temple) and the Mariamnan Hindu temple. The Sultan Abu Bakar museum lies in a colonial era building from 1929 along the riverfront and contains exhibits of the Pahang royal family and of traditional arts and crafts of Pahang. It is possible to reach by bus from KL or Kuantan (two buses daily from KL, several from Kuantan) or for instance by car. There are a number of hotels and homestays bookable through the hotel portals in Pekan.